Is there anyone that would be willing to take a stab at a custom badge I'd really like to see? You can't save all the starfish. I didn't want to assume me merely asking it to be done would get it done despite my awesomeness. 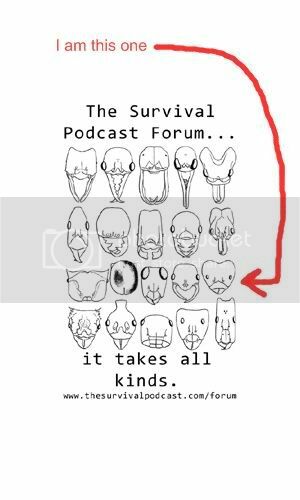 The ant would actually be an overview outline in black like your original ant side view and the SEMPER PARATUS would be Times New Roman and the "The Survival Podcast Member's Support Brigade" would be the same font that you use on the others. Thanks muchly! But it WOULD get it done just by the sheer power of your awesomeness. The power of your awesomeness is why I read "The Moon Is A Harsh Mistress". Don't know how much more power you could ask for. Three words, "Jedi or Sith". And not to derail the thread and you can start another one under Campfire to respond, but what did ya think about TMIAHM? Heinlein's book? Good book... Overly optimistic about humans at some points. But a good read. what did ya think about TMIAHM? I loved it. I still have a lot to think about regarding the professor, but the book was awesome. Makes me wish Mike was real. And you think he's not? Show's how good he is. Shhhh!!!!!! eepkay uietqay! ontday ivegay awayway ethay ecretsay! How do i put one of those badges on my signature? I just joined the brigade and want to show my support. Delete the space between the first bracket and the IMG at the begining --- should be [img] not [_img] --- had tio do it that way so it would display in this message. Just put the image url between the two bolded pieces of BBCode. Thanks DOC. I already have a photobucket account so, I'm halfway. I'll try that editor. The TSP staff asked respectfully before that the soldier NOT be used as forum badges for members. I'm going to reiterate that request again. Please. Do. Not. Use. The. Soldier. Ant. "The TSP staff asked respectfully before that the soldier NOT be used as forum badges for members. I'm going to reiterate that request again. Please. Do. Not. Use. The. Soldier. Ant. Thank you. I don't wish to be argumentative - I simply wish to clarify that the following was what was actually said regarding the matter of usage: "Like DEV said, I'm not going to tell you that you cannot use it, but I will say that I'd prefer it if you didn't." That came from, er, you. Unfortunately at the time of that original note, I failed to fully understand that message in its COMPLETE FORM and, took it out of the full context of the the entire message. The context in which I took it was specifically regarding the "bumper sticker" conversation and not overall - generally. Having gone back for the QUOTE, I reread the message IN ITS ENTIRETY and realized where I had gone wrong. Regardless of the 'leeway' left in the original message, I would not have used the SOLDIER ANT if I had fully comprehended the details of the matter AT the time. I apologize for both my error and lack of reading comprehension skills in this matter. Relax, yes? I'm just saying please don't use it. I wasn't saying you're a douchebag for using it. You're a talented designer, design somethin' else. Okay, this has been blown out of proportion. Photoshop helps me sleep. 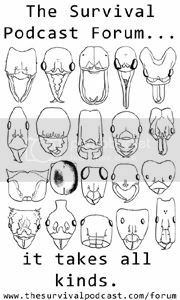 All of the heads are from actual ant species of the world. OK OK. Maybe it doesn't look the one riding shotgun on my glasses. Geez! You can always use the HTML "code" command. HTML inside the code delimiters will not be processed as HTML. Therefore, you can type coding exactly as needed without having to add "disabling characters." Just a lil tidbit I picked up. Nice!!! My super hero has a soldier ant on her boobies. I'm of the opinion that Redheads are proof that, contrary to popular belief, Satan also loves us. Just wanted everyone to know, if you use Mozilla firefox as your web browser, rather then having to create a photo bucket account and saving images to it, and all that jazz, all you have to do is right click on the image you want to copy, click "copy image location", then wherever you want to put the image just type and in between right click and click "paste". If you can understand how to do what i just explained it will save you tons of time in the long run. Unfortunately if you use Internet Explorer you cant do this, but you should be using Mozilla anyway, it protects much better against viruses and what not. I also find it makes pages load faster. Just wanted everyone to know, if you use Mozilla firefox as your web browser, rather then having to create a photo bucket account and saving images to it, and all that jazz, all you have to do is right click on the image you want to copy, click "copy image location", then wherever you want to put the image just type and in between right click and click "paste". If you can understand how to do what i just explained it will save you tons of time in the long run. Unfortunately if you use Internet Explorer you cant do this, but you should be using Mozilla anyway, it protects much better against viruses and what not. I also find it makes pages load faster. 1) Right click on the image and select PROPERTIES, then highlight and copy the URL out of the Address (URL) box. Then insert it between the [ img ][ /img ] markers. For me, the main reason to use photobucket is to store images that I manipulate. Also, occasionally you will run across an image that one site will not let another site 'link to' or 'call' (if it does allow a save then Save and Up to PB) or it might not even let you right click SAVE it. If the latter is the case: hitting PRINTSCREEN (PS) and a paste into my favorite free image program (PAINT.NET) allows a quick cut from the copied page, then a Save of the image, and an upload to Photo Bucket. Very cool info DOC, thank you! Open the cage and let the tigers out!!! I felt left out so I made one. Feel free to use it, resize it, etc. just don't swipe my nifty ant head logo. BTW, it says, "I think therefore I am ant." Here's one I came up with the other night, and Sister Wolf was so kind to touch it up a bit for me. This is for all of us who own and love those tactical firearms that are so terrifying for the bleeding hearts such as Nancy Pelosi and her ilk. They are the disdain of the gun grabbers, the nightmares of Sarah Brady. The Black Rifle is fearsome beast, and I love them all. 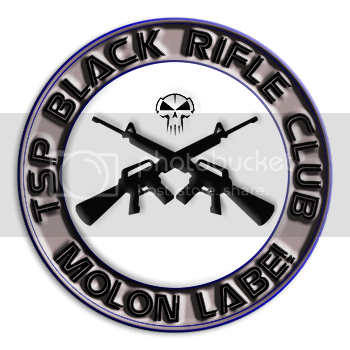 the TSP Black Rifle Club. All dues are to be paid to me. I like cash. Just kidding, it's free. Unless you just want to send me money. BTW, I'm working on a version for all of us AK nuts as well.